Background: Plants and their products have been used to treat human diseases since time immemorial. 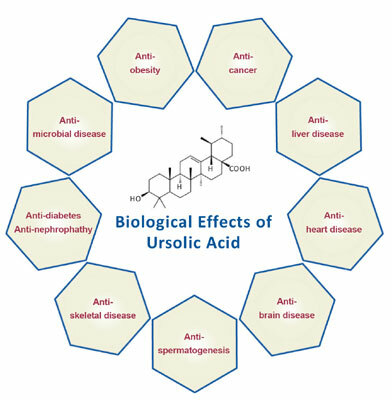 Ursolic acid (UA), a pentacyclic triterpenoid found in a wide range of plants, possesses a plethora of biological traits, such as anti-inflammatory, anti-oxidative, and anti-cancer properties. Extensive research has been undertaken to elucidate the biological, pharmacological, and clinical roles of UA in the treatment of human diseases. However, the mechanism and molecular targets by which UA acts has not yet been clearly elucidated. Methods: This review summarizes the studies, findings, and data related to UA with reference to diseases of the liver, heart, brain, and muscles, fertility, and cancer. Results: Among 89 papers included in this review, 18 papers defined the anticancer property of UA against numerous cancers and indicated the molecular pathways and strategies involved in the therapeutic action. Eleven papers showed protective role of UA in liver diseases including its capacity to enhance liver regeneration. Ten papers included facts related to beneficial effect on cardiovascular diseases and body homeostasis, and showed UA as a remedy for heart diseases. Nine papers demonstrated the medicinal value of UA against brain and neurological disorders. UA showed healing effects in skeletal muscle diseases such as muscle atrophy in 6 papers. Seven papers defined anti-diabetic and anti-nephropathy characteristics of UA. Antimicrobial properties of UA were presented in 10 papers. Six papers showed the ability of UA to cure obesity and hyperlipidemia. In addition, 4 papers revealed negative effects of UA that inhibits sperm motility during spermatogenesis. This review identifies the multifarious therapeutic activities of UA in numerous health disorders including cancer. Conclusion: Summarizing and correlating the published data on UA facilitates better understanding of UA on its potential as a therapeutic agent. Keywords: Ursolic acid, anti-inflammatory, anti-oxidative, anti-cancer, therapeutic agent, anti-liver disease, anti-heart disease, anti-brain disease, anti-microbial disease. Keywords:Ursolic acid, anti-inflammatory, anti-oxidative, anti-cancer, therapeutic agent, anti-liver disease, anti-heart disease, anti-brain disease, anti-microbial disease. Abstract:Background: Plants and their products have been used to treat human diseases since time immemorial. Ursolic acid (UA), a pentacyclic triterpenoid found in a wide range of plants, possesses a plethora of biological traits, such as anti-inflammatory, anti-oxidative, and anti-cancer properties. Extensive research has been undertaken to elucidate the biological, pharmacological, and clinical roles of UA in the treatment of human diseases. However, the mechanism and molecular targets by which UA acts has not yet been clearly elucidated.